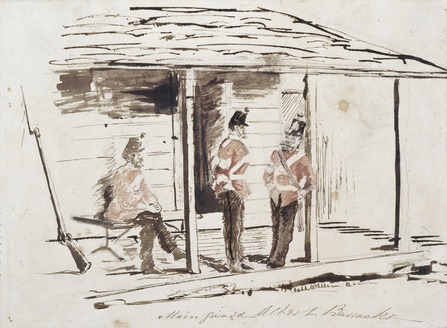 Albert Barracks 1860s, Auckland, New Zealand. Around 12,000 men from the British imperial regiments and the Royal Navy fought in the wars in New Zealand c.1860-70. Who were they? Where did they come from and where did they go to? What was the garrison culture they carried across the wide span of the 19th-century world: a world in which the distinctive figure of the redcoat was everywhere recognised as a sign of British authority. Our research project aims to put a face to the British army and navy presence in New Zealand. In doing so we aim to link the service of men in this part of the world to the wider British empire. Our interest focuses on the ways in which war takes people, goods, ideas and habits around the world. Engaged to suppress resistance to British expansion, the armed forces also served as vectors of empire. We are focusing on the world beyond the battlefields.